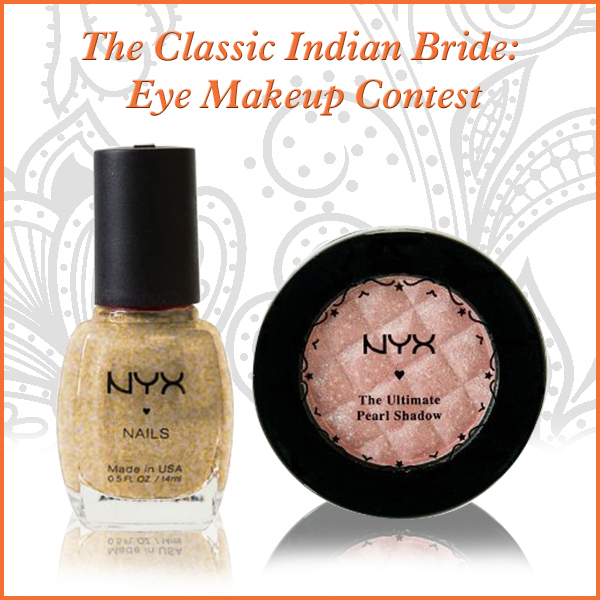 The Classic Indian Bride: Eye Makeup Contest! - Divassence! Here’s an exciting contest for all you eye makeup enthusiasts out there! Divassence in collaboration with Stylecraze and Zestful Nails is holding an eye makeup contest keeping in mind the wedding season and guess what? The prizes are totally droolworthy! You can win a NYX Gift Hamper worth 1000 INR! You can also recommend particular shades of blushers or lipsticks that would go with the eyemakeup for the benefit of readers. Your eyemakeup look should have a creative title along with the list of products used. Instructions as to how to go about achieving the look is optional. You can send in your entries to Divassence (divassence(at)gmail(dot)com)and once it is published on the blog, it will also be uploaded on Stylecraze. Once we’ve finalized the entries, voting will be open on Stylecraze and the look which garners the maximum no. of votes will be declared the winner. The contest is open only to residents of India. Note: We strongly oppose plagiarism and only original entries will be considered. If we find your entry to be fake or taken from somewhere else then you’ll automatically be disqualified. The contest starts on the 29th of November and the last date for submitting entries is 25th December 2012. From the 26th, your entries will be put up for votes on Stylecraze and the results will be announced on 1st January 2013. So what are you waiting for? Get your palettes and brushes out and show us your interpretation of a classical bride! Disclaimer: If any one of the rules aren’t followed Divassence has the right to reject the entry. The contest is sponsored by Stylecraze. The final winner will be chosen only on the basis of votes on Stylecraze. Divassence! has no role in deciding the winner. awesome giveaway…i am surely going to send my entries…bridal eyemakeup…i love i love!! !